Looking north on Crocker Lane in North Albany on Tuesday morning. On Sept. 25 a reader wondered when the street construction on Crocker Lane in North Albany would be finished. It took me a week to remember to ask Albany Public Works, but today I finally did. 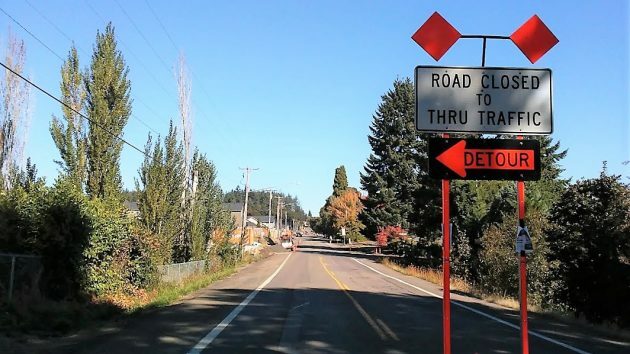 “Is it on schedule and when will the road be open again?” Janelle Swatman wanted to know. In May the city council awarded the construction contract to Carter & Company, of Salem, based on its low bid of $1,861,694. The contract covers about 2,100 feet of Crocker Lane from Valley View Road to Meadow View Drive, including a water main of the same length. Cerklewski says the contractor started work on June 7, and the contract requires all work to be completed by Nov. 3. If it’s not all done, he says, the contact calls for a penalty of $800 per day that completion is late. The city engineering staff has the power to punish the contractor via a “penalty”? I doubt it. More likely the $800/day is a liquidated damage meant to compensate the city for the additional expense of a contract breach. Either way the contractor is out the $800, but could recover in court if the city’s intent is to punish. Your blog post would be evidence against the city. Mr. Cerklewski needs to be more careful with the words he chooses. I think that time would have been better spent figuring out how to manage traffic at Crocker and Gibson Hill. That intersection is a minute away from a tragic t-bone or multi car pile up. If you are going to improve infrastructure to allow for more residents (water mains, additional or improved roads, etc.) then you must improve neighborhood access points as well.